Long before Americans discovered FOMO — the fear of missing out — Singaporeans were fixated with its more excessive forebearer, kiasu. Taken from the Chinese dialect Hokkien, kiasu translates to a fear of losing out, but encompasses any sort of competitive, stingy or selfish behaviour commonly witnessed in this high-flying city-state. If you stand in line for hours just because there’s a free gift at the end, then you’re kiasu. The national narrative is that we are a small country in a very large world. We have very limited resources. If we don’t fight for our own future, no one else will. If you claim a spot at a table at a busy food court with a packet of tissues while you wander off in search of grub, you’re kiasu. If you’re a parent who volunteers hours of your free time at a school just so your offspring has a better chance of enrolling there one day, then you’re most definitely kiasu. 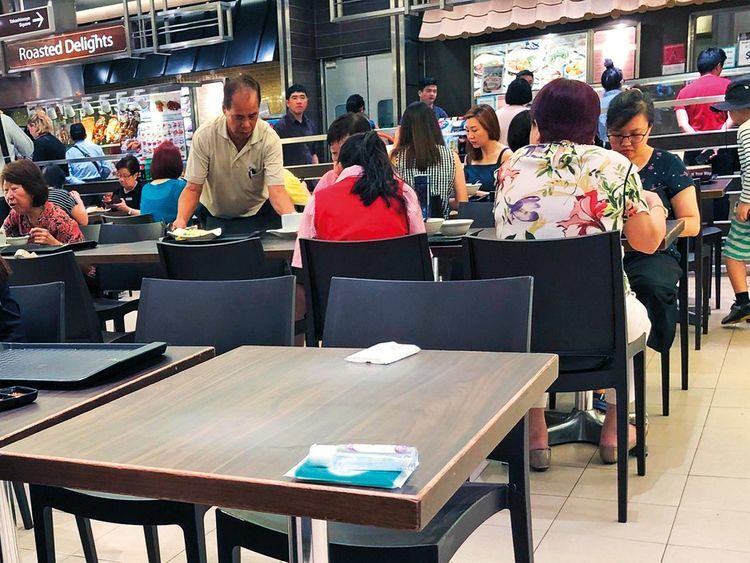 It’s a survival instinct born out of Singapore’s dominant Chinese culture and deep-rooted insecurity as a blip on the map, one that’s only slightly bigger than the San Fernando Valley. Letting opportunity pass is tantamount to failure, the thinking goes. And if you do, you have no one to blame but yourself. Kiasu (pronounced kee-ah-sue) embodies a sort of unofficial national character, not unlike Japan’s harmonious wa or Britain’s stoic stiff upper lip. It’s an inescapable aspect of life in this country of 5.6 million that drives people to try and outdo one another. Yeo’s neighbourhood growing up boasted one of the top primary schools in Singapore, Rosyth School. To assure a place there, Yeo’s mother had to compile hours of volunteer work. At least twice a week, she read to students at the school before heading to work. Doing anything less risked losing her daughter’s place to someone else. “She’s a tiger mom,” said Yeo, who was also enrolled in rigorous after-school tutoring programmes, a private industry that has grown into a $1 billion business here because of the parental arms race. The volunteer system in schools breeds another layer of competition. Parents complain about other parents who have exceeded their quota for hours, but continue to hog opportunities to volunteer. “People feel like others have to lose in order to win,” said Donald Low, a closely-followed economist and former public official. Foreign policy in Singapore isn’t immune to kiasu either. The feeling of vulnerability it engenders helps explain Singapore’s outsized spending on defence, which at more than $10 billion, is more than any other country in Southeast Asia. The dread of having someone steal your lunch could also be driving Singapore’s hardening stance against Malaysia in an ongoing territorial dispute over a sliver of airspace and sea between the two countries. “Politicians were openly calling for people to stand up and defend the nation over what seems to be technical differences,” said Ja Ian Chong, a political scientist at the National University of Singapore. “That the state and Singaporeans were ready to treat the issue as existential suggested a deep sense of fear,” he added. For an earlier generation, that fear propelled Singapore’s improbable success after it broke away from Malaysia in 1965 to later become one of the richest countries in the world on a per capita basis. But a fear of losing can also trigger paralysis when it comes to risk-taking. Kuik, the former member of Parliament, said Singaporeans today need to be inspired and not cowered. There are modest signs of a kiasu backlash, including last year when a small group of parents formed “Life Beyond Grades”, an organisation that seeks to relieve academic pressure on children to focus on their wider well-being. It’s an uphill struggle. Singaporeans are exceptionally self-aware of their reputation — even without reminding from their traditional Malaysian rivals, who are prone to calling the country Kiasuland. A survey released last year by the Institute of Policy Studies, a local think tank, found that Singaporeans perceived their society to be kiasu more than any other trait. It’s in our blood. You realise you have to work harder to be earlier than the next guy. Giant, a local supermarket chain, ran a contest in 2017 to determine which neighbourhood was the most kiasu. The winner, an eastern town called Tampines, impressed with a high percentages of residents admitting to excessively pressing the crosswalk button. Some lines are still talked about today, like the time when thousands of Singaporeans thronged outside McDonald’s restaurants in a kiasu-crazed bid to score free Hello Kitty toys. The pull to line up has even inspired a business, iQueue. The service, which is similar to errand apps such as TaskRabbit, gets up to 50 requests a month to stand in line for things such as BTS concert tickets or boba tea. Justin Zheng, a manager at the company, said he queued in line for 12 hours outside a prestigious art class last month for parents who wanted to register their elementary-school-aged child. Zheng arrived at 7pm the night before the doors opened and still found someone ahead of him in line. By midnight, there were 100 in line. By the next morning, he estimates there were twice as many people. The parents next to him weren’t even taken aback that Zheng didn’t have any kids and was hired to be there. Instead, they took down his number. Anything to gain an edge, they told him.